Whether you are designing the decorations for an elegant garden party or a grand wedding feast, make sure you don’t forget these blooming beauties. Set up your tablescape with delicate lanterns in any color that matches your theme, surrounded by a ring of hydrangeas. Pick complimentary linens, flatware, dishes and glassware, and you will create a stunning display with a soft glow that emanates from the lanterns down the center of the table. Mix luscious hydrangeas with other exotic-looking blooms for an ultra-modern look that will impress everyone! Opt for colored blossoms like . You can arrange these in a traditional glass or ceramic vase, or try a rectangular bamboo box for a more updated feel. Create colorful and fun centerpieces for any event, even if it’s just Tuesday dinner on the patio! Fill a glass vase with whole lemons or limes (you can slice them too!) and stalks of plump hydrangeas. The white of the flowers will be a perfect contrast to the vibrant fruit colors, and the entire creation will make for a fresh and summery focal point. For a truly unique way to decorate your deck or patio space, make a display yourself with a few mason jars, some twine and multicolored hydrangea blooms. Pick a few purple, pink and white ones to rest in the jars, and then string them up so they hang vertically down the walls of your deck. You have just created a piece of living art that is as creative as it is beautiful! Hydrangeas can also be dyed to match the colors of your decor. Simply fill a vase with water and a pint of lemon-lime soda. Add a teaspoon of bleach and some drops of food coloring to the water in any hue you like. More food coloring creates a deeper color. Cut the stem of a white hydrangea at an angle and set the flower in the vase. It will draw the water up through the stem and as the food coloring seeps into the petals they will change color. 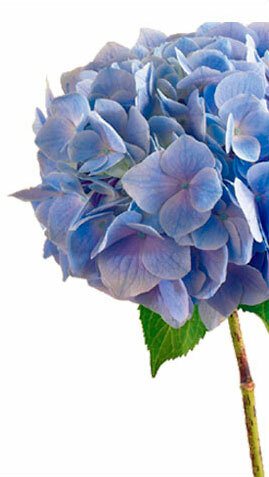 Learn more about the Symbolism & Meaning of Hydrangeas. Putting on the Luxe! Add Class to Your Outdoor Celebration! The best flowers for a spring or summer party are full of color! Create a display of sunflowers, red roses, dainty purple blooms and green leaves for a vibrant bouquet. Cactus Dahlias are great for warm weather too. They’ll stand up to the heat, and their unusual spiky appearance and bright colors will add drama to any table. If you want to go another route, try potted plants like ferns on your table. You won’t have to worry about the heat affecting your blooms, and potted plants are a unique touch. You can also opt for some succulents, which don’t require much maintenance but still provide a beautiful look for your decor. Daffodils are another great choice because they are used to warmer climates, are bursting with color and can really make an impact at the center of your party. Embrace the season and decorate your tables with summery centerpieces! One creative option is to include oranges, lemons and limes in your display. Arrange an armful of white lilies, roses and hydrangeas in a vase for a pale backdrop, and then add your vibrant fruits. You can place a few inside the vase for an unexpected splash of color, or add some around your flowers on the table. Don’t forget a few punches of green for a natural look, and you’re sure to create a wonderful-smelling centerpiece! Another option for a more rustic look is to gather some old or antique watering cans and repurpose them into vases for some bright tulips! They’ll look like you just picked them from the garden if you allow the tulips to rest lazily in their new vase. Tulips also grow in colors like pink, white and purple. Blend them into the rest of your decor or let them stand out against a neutral backdrop. Hosting a spring or summer party means enjoying the weather with refreshing drinks and dishes. Take your cue from the seasons and include fruits and vegetables in every dish. You can prepare summery salads made with ingredients like pickled cucumber or tomato and avocado. Picnic sandwiches are a great entree option if you don’t want to worry about bringing utensils outside. Try a turkey caprese sandwich with fresh tomatoes and basil. Picnic foods are great for events like these because you can make them in advance and they travel with ease. Offer your family and guests refreshing glasses of water with fruit or vegetable-infused ice cubes! They’re sure to keep their cool no matter what the temperature. Cucumber puree, orange-lime and lemon-raspberry are just three options. The hostess mom loves to entertain and makes it all look easy! Present her with something she can place in the center of her beautifully arranged table. Teleflora’s Bejeweled Beauty bouquet is the perfect choice in a modern violet glass cube that will beautifully accent any dinner party. Hot pink roses nestle next to dark red spray roses, purple carnations and pink miniature carnations. Accents of assorted greens create a display that will be the talk of the party. The busy mom is always on the go, making sure everything is taken care of, including you. Give her a beautiful bouquet that arrives in its own gorgeous vase so she doesn’t have to run around looking for something to match the colorful blooms. The Butterfly Serenity arrangement features a painted mug she can use once the flowers have faded. Decorated with lavender butterflies against a sunny yellow background, this mug holds a mix of purple roses, lavender alstroemeria and cushion spray chrysanthemums with yellow daisy spray chrysanthemums. Fresh greens including bupleurum, pitta negra and lemon leaf add to the mix. The fashionista mom looks her best no matter what she’s doing. Celebrate her sense of style with a stunning bouquet from Teleflora. Choose something that is as unique as she is. The Imagination Blooms with Cymbidium Orchids will take her breath away! This creative arrangement is unlike any other with pink asiatic lilies reaching toward the sky next to pink roses and cymbidium orchids. The collection is presented with variegated ti leaves, bear grass and curly willow in a modern, square black dish. The light of your life brightens a room whenever she enters and can always make everyone smile. Show her how much she means to you with a sunny and cheerful arrangement like the My Little Chickadee bouquet, which arrives with a cute little chick bearing blooms. Crisp white daisies, sunny yellow roses and green button spray chrysanthemums mix together in a ceramic vase that can be used again and again, and will bring a smile to anyone’s face. The all-natural mom makes a point to care about you and the environment. Use her personality as inspiration when you’re choosing her floral gift. Opt for something like Teleflora’s Spring Has Sprung basket, which looks like she just returned from a walk in the garden with an armful of blossoms. African violets sit next to yellow begonias, hot pink kalanchoe and white hypoestes adding a natural and beautiful element to any room.